Per Urlaub: Why is the US Green Party so irrelevant? October 18, 2016 – Many Americans value environmental protection and want to see more of it. But Jill Stein, the Green Party presidential candidate, is drawing only 1 to 3 percent in recent polls, even in an election where many voters dislike the major candidates and are looking for alternatives. Stein certainly has worked to differentiate herself from the two major party candidates. In July she asserted that electing Democratic nominee Hillary Clinton – probably the choice of most pro-environment voters – would “fan the flames of … right-wing extremism,” and be as bad as electing Donald Trump. Jill Stein crashes the Democratic National Convention, Philadelphia, Pennsylvania, July 26, 2016. While Stein makes anti-establishment statements like this, her German counterparts have been advancing a green agenda in local, regional and national government for the past 30 years. Most recently, Winfried Kretschmann was reelected this year as head of government in Baden-Württemberg, one of Europe’s technologically and industrially most advanced regions. I grew up in Germany and have taught about Germany and Europe in the United States for the past 15 years, so I have seen Green Party politicians at work in both countries. In my view, there are two reasons why the U.S. Green Party remains so marginal. Structurally, the American electoral system is heavily weighted against small political parties. But U.S. Greens also harm themselves by taking extreme positions and failing to understand that governing requires compromise – a lesson their German counterparts learned several decades ago. Both European and North American Green Parties evolved from activist movements in the 1960s that focused on causes including environmentalism, disarmament, nuclear power, nonviolence, reproductive rights and gender equality. West German Greens formed a national political party in 1980 and gained support in local, state and federal competitions. Joschka Fischer, one of the first Greens elected to Germany’s Bundestag (parliament), served as the nation’s foreign minister and vice chancellor from 1998-2005. The German Green Party’s rise owed much to the country’s electoral system. As in many continental European democracies, political parties win seats in German elections based on the percentage of voters that support them. For example, a party winning a third of the popular vote will hold roughly a third of the seats in the parliament after the election. Proportional representation makes it possible for small parties to gain a toehold and build a presence in government over time. Countries that use various forms of proportional representation at the national level (click for larger image). In contrast, U.S. elections award seats on a winner-takes-all basis. The candidate with the most votes wins, while votes cast for candidates representing other parties are ignored. As a result, American voters choose their leaders within a de facto two-party system in which other parties often have trouble even getting their candidates’ names onto ballots. U.S. Greens have won only a handful of state-level races, and have never won a congressional seat. Their greatest success came in 2000, when Ralph Nader and Winona LaDuke won 2.7 percent of the popular vote in the presidential election. Many observers argued that Nader’s only real impact was to throw the election to conservative Republican George W. Bush, but Nader and many of his supporters strongly disagreed, and the question of whether challengers can act as more than spoilers in U.S. elections remains controversial today. As green politicians have helped to shape political priorities in Berlin, Brussels and other European capitals and regions, many observers have debated whether these former activists are selling out by participating in the political process – and whether joining that process helps or hurts the green movement. During the 1980s and early 1990s, Green Party conventions in Germany were dominated by fierce infighting between moderate “Realos” (realists) and radical “Fundis” (fundamentalists). The Realos, who prioritized electability over ideology, eventually prevailed. In order to graduate from an opposition party to a ruling party that controlled cabinet posts, German Greens had to develop a capacity for compromise. To gain power, they had to form coalitions with center-left Social Democrats. But coalitions require consensus – especially in parliaments with proportional representation. 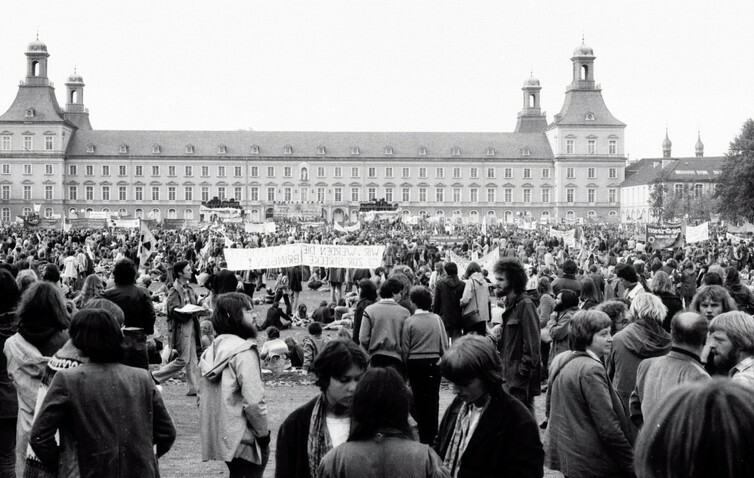 120,000 people attend an anti-nuclear protest in Bonn, Germany on Oct. 14, 1979 after the Three Mile Island nuclear accident in the United States. However, these compromises did not erode broad public support for the Greens. On the contrary, in 2002 the red-green coalition was reelected and the Green Party received more votes than it had in 1998. When the coalition government broke down in 2005, it was due to Chancellor Gerhard Schröder’s lack of leadership within his own SPD. 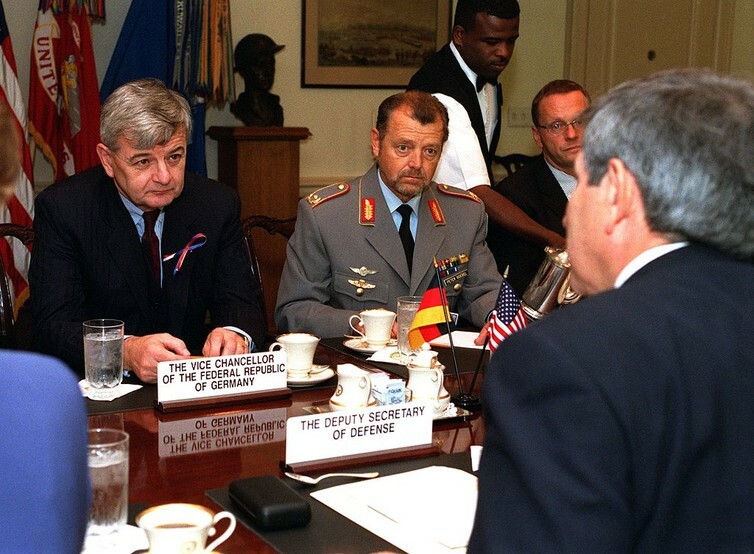 Foreign Minister Joschka Fischer (left) discusses anti-terrorist initiatives with U.S. Deputy Secretary of Defense Paul Wolfowitz at the Pentagon on Sept. 19, 2001. Although the Green Party has not regained control of Germany’s federal government since 2005, its positions have become part of the nation’s mainstream political culture. Notably, after the 2011 nuclear plant meltdown in Fukushima, Japan, a center-right German government decided to accelerate the phaseout of nuclear power in response to rising public concern. To reach this goal, Angela Merkel’s centrist government has implemented an ambitious policy bundle known as the Energiewende that seeks to transition Germany to a nonnuclear, low-carbon energy future. Massive governmental support for alternative energy sources has encouraged Germans, especially in rural areas, to invest in solar power, wind turbines and biomass plants. These green policies did not harm, and may have buoyed, Merkel’s status as one of the most popular German chancellors prior to this year’s controversies over immigration. Germany reformed its renewable energy law this year in response to new European Union rules governing electricity markets, and will shift from subsidies to market-based mechanisms, but the Energiewende remains highly popular.